Rooftop Housing Group is part of Rooftop Housing Association, they provide rented housing accommodation, let upon ‘assured tenancies’ for people in housing need. The majority is family accommodation but a significant proportion is sheltered or extra care housing, supported housing meeting special needs and also accommodation for Key Workers. As of April 2014 they provide over 6,150 homes in the Worcestershire and Gloucestershire areas. Heming won the project to provide off road, ring-fenced parking to Rooftop Housing Group residents around the busy Christmas period. The main priorities being finishing on-time and with minimum disruption to residents. Some of the project challenges included all works needed to be contained within the perimeter of the car park itself, this confined working space made the project much more difficult. Also, due to the location and layout of the site, access and egress for materials was not easy. The materials used create a permeable surface helping to avoid any potential water retention and pooling resulting in a long term, fit for purpose solution. The location was a busy residential estate and the project was carried out on the run up to Christmas in 2014, so keeping disruption to a minimum was paramount. 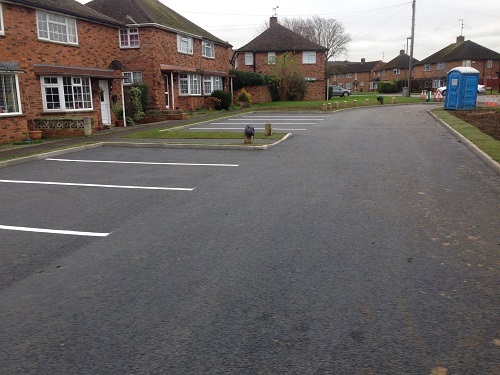 The residents are now very pleased to have a permeable, off-road parking area that is reserved solely for their use. Internal Surveying Consultant, Rooftop Housing Group.